Japanese re-entry vehicle technology satellite. DASH. DASH (Demonstrator of Atmospheric Reentry System and Hypervelocity) was a small secondary payload built by ISAS, the scientific space agency which was to merge with NASDA. Status: Operational 2002. First Launch: 2002-02-04. Last Launch: 2002-02-04. Number: 1 . Gross mass: 70 kg (154 lb). Height: 0.70 m (2.29 ft). DASH's mission was to test the re-entry system for the MUSES-C asteroid probe. The main spacecraft was equipped with a solid deorbit motor and two small orbit adjust thrusters. Attached to this was a reentry capsule, 0.4m in diameter and 0.2m high, with a mass of 16 kg. The plan was to fire the deorbit motor three days after launch, then separate the reentry capsule which would enter the Earth's atmosphere at 10 km/s and land in the Hodh el Gharbi region of Mauritania at about 8.5W 17.2N. However the spacecraft did not separate from the rocket due to a pin wiring error, and the mission failed. 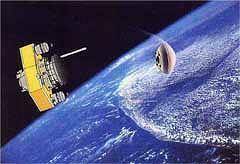 At 11:45 Japanese Standard Time on February 4, 2002, the Demonstrator of Atmospheric Reentry System with Hyper Velocity (DASH), which had been developed by ISAS, was launched from Tanegashima Space Center as a piggyback payload on the second flight of H-IIA rocket developed by NASDA. Approximately 30 minutes after the launch, the separation of DASH from the rocket was planned, but the acknowledge signal for the separation was not confirmed. While the mission continued, telemetry signals from DASH were received by the Santiago ground station during the time period from 17:40 to 18:40. These telemetry data showed that DASH was still alive but most likely not released from the payload attach fitting, which was a part of the rocket. Based on the above findings, Kagoshima Space Center began rescue activities, from 23:00 of the same day, to release DASH from the payload fitting. Although best efforts were made to rescue the mission, it became clear that DASH could not be released from the payload attach fitting, and in the evening of February 5, ISAS decided to abort the entire DASH mission. Immediately after the mission abortion, ISAS established a tiger team to investigate a cause of failure, and this team found soon that a signal which would enable the start of the sequence of DASH separation had not been properly delivered through the cable connected with the rocket. This was due to an error of pin assignment in a drawing to manufacture a connector connected DPU (Data Processing Unit) of DASH with the rocket. Such a simple mistake should have been easily found through various checkout procedures before launch, but in the case of DASH, this flight connector was not used throughout the ground checkouts. Because the DASH, as a piggyback payload, had an interface with the rocket as little as possible, enough function tests of DPU could not be executed through this flight connector and then another special cable and connector had been used for the ground checkouts. As the result, this error could not be found until the real flight. To execute the DASH mission, a significant preparation effort was required since the DASH operation teams were globally distributed to support the mission. While the rocket was launched from Tanegashima Space Center (Japan), parallel activities were executed at Kagoshima Space Center for the tracking and mission operations (Japan), at Santiago for tracking (Chile) and at the landing site in the Sahara desert of Mauritania. Atmospheric hypersonic flight was one of the key technologies not only for planetary entry probes but also future space transportation systems. DASH (Demonstrator of Atmospheric Reentry System with Hyper Velocity) mission was a collaborative mission between ISAS and NASDA. The main objective of the mission was to demonstrate high-velocity atmospheric earth reentry at the velocity over 10 km/s and to conduct "high-velocity reentry measurements" by onboard instruments during the flight. The spin-stabilized satellite DASH had a total weight of 86kg, which could be divided into two portions: a re-entry capsule to conduct re-entry experiment, and its carrier involving a propulsion system, a communication system, attitude and orbit control systems, and others. The attitude of the DASH system at the separation from the rocket was to be stabilized by the momentum wheel until the ignition of the spin motor (SPM). In order to reduce the reentry point dispersion, the attitude of the orbiter would be maneuvered by the cold-gas jets based on the earth-horizon sensor (HOS) and the sun sensor (PSAS). After the deorbit by ignition of the deorbit motor (DOM), the orbiter was to have deployed the yo-yo despinner and the capsule was separated. The DASH orbiter was to be inserted into the geostationary transfer orbit (GTO). The orbiter in GTO was to adjust the orbital period by the drift motor (DFM) for the reentry to the planned point in the Sahara desert in Mauritania Three days after the launch, the capsule was to have separated from the orbiter and conduct reentry over the Sahara desert in Mauritania. The capsule was to be exposed to the extremely high aerodynamic heating rate up to 10 MW/m2. The obtained data were to be transmitted through the telemetry to the ground stations during the slow descending phase after the parachute deployment. The geometry of the reentry capsule was designed so as to have natural aerodynamic stability as well as to perform its ballistic reentry flight. Due to the strict requirement for a lightweight and minimum envelope, a blunted cone was selected for the configuration. The capsule subsystems were composed of the mainframe structure, onboard instruments, the thermal protection and control systems, and parachute system including pyrotechnic separation devices. The capsule's diameter was 40 cm and its total weight was 19 kg. The capsule was thermally protected by the carbon phenolic ablation heat shield. A cross-type parachute was installed in the capsule. Weights: Wet 88.9 kg ( including Capsule ) ; Dry 85.8 kg; Capsule 18.9 kg. Family: Re-entry vehicle technology satellite, Technology. Country: Japan. Engines: DOM, DFM. Launch Vehicles: H-II, H-IIA, H-IIA 2024. Launch Sites: Tanegashima, Tanegashima Y. Agency: ISAS. Bibliography: 2, 4, 551, 552, 554. 2002 February 4 - . 02:45 GMT - . Launch Site: Tanegashima. Launch Complex: Tanegashima Y. LV Family: H-2. Launch Vehicle: H-IIA 2024. DASH - . Mass: 70 kg (154 lb). Nation: Japan. Agency: NASDA. Class: Technology. Type: Navigation technology satellite. Spacecraft: DASH 2002. USAF Sat Cat: 27368 . COSPAR: 2002-003B. Apogee: 35,778 km (22,231 mi). Perigee: 357 km (221 mi). Inclination: 28.30 deg. Period: 634.00 min. The VEP-3 launch instrumentation package mounted on top of the DASH had a mass of 33 kg. The side adapter panels were halves of a 4.1m long 4.0m diameter cylinder. 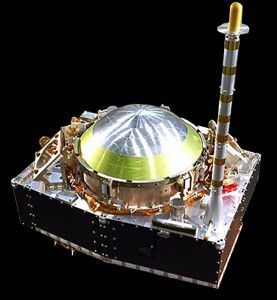 DASH (Demonstrator of Atmospheric Reentry System and Hypervelocity) was to test the reentry system for the MUSES-C asteroid probe. The plan was to fire the deorbit motor three days after launch, then separate the reentry capsule which would enter the Earth's atmosphere at 10 km/s and land in the Hodh el Gharbi region of Mauritania at about 8.5W 17.2N. Typical satellite reentries are at only 7.5 km/s, while hyperbolic (escape) velocity at the top of the atmosphere is over 11 km/s, so DASH would have been travelling much faster than typical reentry vehicles, but not quite at escape velocity.